Remote Program Management from Frantz Group is built from the ground up to bring focus and discipline to your internal calling teams. Most technology organizations lack the experience and skill sets to properly support telemarketing and phone based lead generation efforts. Most attempt to manage these efforts through sales, marketing, or customer service leaders who have spent the majority of their time working with prospects after they have expressed interest. This leads to a situation where your calling resources, the people who’s primary job is to introduce new prospects to your brand, wind up under-trained and less effective than they could be. New business prospecting requires a specific level of coaching and reinforcement to be successful. Your resources need focus and discipline to be successful in building new relationships. Campaign & Product Training – Our experts will help refine your existing training materials to be more effective for lead generation and inside sales resources, the people who are tasked with building rapport with new prospects. Cadence is critical to success, we teach when and how to use email and social connections in conjunction with calling efforts to drive optimal results. Conversation Training & Coaching – Technology lead generation involves much more than simply getting a few yes/no answers out of a prospect. Our team will teach your resources how to improve their conversational style, fitting their material to the tone and candor of the prospects to drive better rapport and deeper conversations. Call Recording & Monitoring – Recording and monitoring conversations allows for regular review of progress and charting improvement of your callers. Results Tracking – Too often, campaigns are graded on pass/fail, did we get enough leads? The problem with that approach is you may not have the metrics in place to determine where calling campaigns are failing to resonate in market. We help tune and adjust your CRM tracking to gain deeper information from your calling efforts that go well beyond the pass/fail nature that many use to grade their campaigns. Campaign Insights & Recommendations – Messaging needs to evolve based on live feedback to be successful. The steady tuning, and larger recommendations based on in-market conversations provide the biggest means for results improvement for your telemarketing efforts. 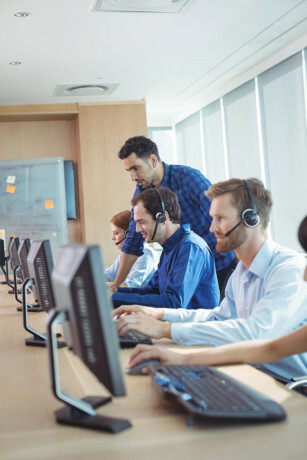 Resource selection & hiring – If you’re looking to expand your team or move telemarketing efforts in-house, our call management experts can assist you with selecting, interviewing and hiring the right resources for the job. Calling jobs can be very challenging to hire and retain for, Frantz Group has 25 years of experience in successful hiring and retention programs for telemarketing work. Want to learn more about Remote Program Management? Contact us today, or give us a call at 800-707-0064. We’re happy to custom fit an approach that improves the performance of your internal lead generation and business development resources.